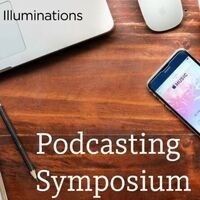 This symposium invites podcasters, scholars of media, cultural critics, and students interested in knowing more about podcasts to consider the platform as a powerful contemporary form of information, dissemination, and cultural production. Our goal is to spark debate about the kinds of public spheres enabled by podcasts, exploring their possibilities and limitations. Part of that exploration involves situating the emergence of podcasts in a larger historical framework of radio and its relationship to news reporting, story-telling, genres of narrative, and social and political activism, as well as forms of digital cultures. And we will also be attentive to complex interweaving of creative, institutional, and infrastructural interests that combine to produce different kinds of podcasts. Finally, in an effort to mix theory and practice, we offer workshops on designing and developing podcasts. UCI Illuminations, UCI Office of the Campus Writing Coordinator, UCI Humanities Commons, UCI Illuminations, Department of English, Department of Film & Media Studies, and Department of Asian American Studies.